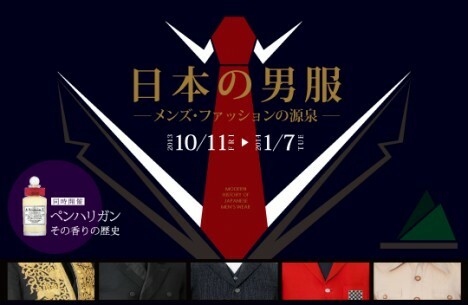 Kobe Fashion Museum will present “Japanese men’s fashion – Origin of Men’s Fashion”. In this exhibition, the history of man’s Japanese clothes from dress suits in early Meiji period, to military uniforms, formal uniforms in Meiji, Tisho, Showa period, and VAN, Edwards, Novelty etc. Through this exhibits, it explore the formation of men’s fashion from the beginning of the Western clothes. Also as a related event, “History of the Penhaligon’s fragrance” exhibition about Penhaligon who was appointed “The Barber of Royal Warrant and perfumer” in the end of the Victorian era, symposiums, seminars and gallery talks will be held.